Your children should not be forgotten when you are visiting historical cities. This tour is especially (but not exclusively) for them. It is conducted from their perspective and shows Warsaw as a magical place of old myths, legends and stories. Forget about Warsaw’s history and business aspirations and discover the world of kings, princes, devils, and ghosts. 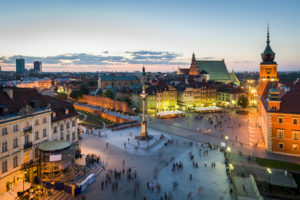 Your kids will hear tales about Warsaw’ s Mermaid, the mythical city founders Wars and Sawa, the Golden Duck, the evil Basilisk, the Chmielorz devil, the Three Crosses hermits and the doings of Master Twardowski. All family members will have fun and a pleasant day in the Polish capital. Very thorough tour and knowledgeable guide. Really impressed with Anna and how accommodating you were with our late arrival.